It is a world of bright vermillion, emboldened by the afternoon sun, slits of light and forest green flicker through from above and from the sides like an old moving picture. Wooden torii gates of all sizes mark the paths up and down the mountain. And to walk underneath them is discovering an older Japan, a land full of holy places, gods and spirits. After the main entrance of the shrine, the smaller wooden torii gates are thin, low and narrow, closely bundled together. To walk through them, is like being pulled gently through a tunnel; the transportation into another world begins. This is the rabbit hole in which dear Alice falls and falls and falls, dropping down into a reality in which perspective is suddenly different. The experience here, however, is much gentler, much more wonder-full, without the slightest feeling of struggle. I become small or the gates grow bigger (depending on the perspective) further up the mountain. They vary in size, but never again so small or tightly knit as that first level. Walking up Fushimi Inari shrine, built in 711AD, in Kyoto, Japan is an experience. It feels magical and out of time. Even with throngs of tourists bustling past or falling behind, the journey up and down the mountain lends itself to quiet isolation. It becomes more quiet the higher up the mountain–at least late in the afternoon–people are more sparse, simply dropping away, both literally and figuratively, as many turn back, feeling daunted by the seemingly unending torii. I, on the other hand, feel challenged, I want to know where it goes, I want to complete it. (This rationale gotten me to scale some pretty interesting heights). I have been looking forward to returning here. Some places you can see once and that’s enough. We tourists are always looking for something new to titalize the senses. But Fushimi Inari, the memory of it–I knew I wanted to go up it again. Torii gates are symbols of the passage between one reality to another, between the everyday to the spiritual world. For me, walking beneath these red-orange gates is a ritual that actualizes a spiritual journey, in a way that the ashtanga practice, aptly “sadhana,” similarly does, as well. Breathing, moving through the postures, holding a posture those full five breaths–each posture, each breath is a gate, through which our body must move and from which the body emerges more subtle, purified by action, and more fortified too. The physical practice softens the body, and with it the mind. Slowly, these movements in space help move us up and down that deep internal mountain with its sometimes sweepingly gentle curves, other times steep ascents and descents, sharp turns, and, on occasion, fairly flat ground. Our practice, which starts with surya namaskar, recalls rituals of old, morning prostrations that connect us to nature, the nature that is all around us, but the one within too, all of it connected to the Absolute. By getting on the mat, we engage in a ritual of sublime regularity, it is a transportation device that brings us closer to our spiritual world. 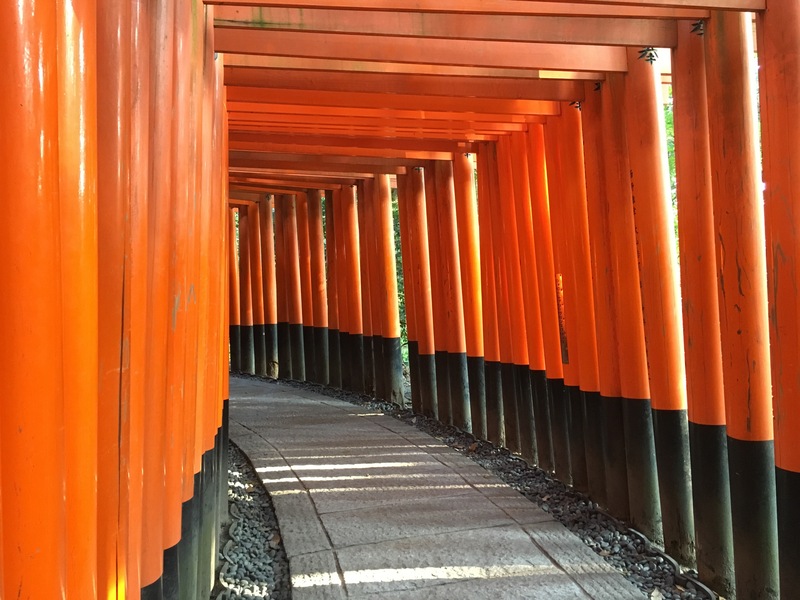 Fushimi Inari, the Ashtanga yoga practice, and other rituals of spiritual transport serve the purpose of softening the boundaries of reality, allowing us an experience of a world beyond the veil, a realm of spirit or magic or God, what have you. Three years ago, I didn’t make it up to the very top of Mount Inari, turning back to make an appointment in the city proper. This time I was determined to make it to the highest point on the mountain. The odd thing was that I almost didn’t realize that I made it. I stopped to look at the trail map, only to notice a small sign, only slightly bigger than a post card: “Top of the Mountain.” I looked around. I was, in fact, at the top, there wasn’t any more mountain to scale, just more torii gates going down. The top was barely noteworthy, except for the funny feeling that I nearly missed it. And then, like that, I was simply back on track, on with the trail, more torii gates as I descended the mountain. Of course, how fitting! What better example of it’s-not-about-the-destination-rather-about-the-journey. The magic of Fushimi Inari isn’t getting anywhere, there’s no venerable God-like figure waiting up the top of the mountain waiting to give you a certificate of completion and a pat on the back. There’s an old man selling refreshments and snacks from his shop, and, of course, more shrines, more offerings. No one even attends to them, there are no priests of facilitators between you and your Highest. Nor does the path end at the top, the torii gates go on quite a bit, though they become quite sparse towards the bottom, where there are more open spaces between them, more forest, as if the mountain is gently loosening its grasp, helping one exit from its otherworldliness. And we see out beyond the red: trees, nature, the world. Eventually the torii gates peter out completely, without ceremony or fanfare, into shrines interspersed by houses, before you know it, you’re just in the local the community, a short distance from the entrance of the shrine compound. I realize my own mistake, there is no end, only more journeying, but one that must now be continued in real time, in real life, in the flesh, bone and blood world that we live in. In our own yoga practice with its clear beginning and end, the spiritual communion seems clear. But those who have been practicing long enough also know that the long arms of our sadhana is not content to stay bound on our rubber mat, that the juiciest bits of transformation happen in our lives, our work, our relationships. These tools however exist for a purpose, they remind us that there’s more, that there’s more magic, more blessings, more world to love and experience.